When building a computer one of the most important parts is applying the thermal paste. If you don’t do this properly your CPU may not be cooled properly and may both run hotter and fail a lot faster than a properly cooled CPU. There are two things to look at when choosing a thermal paste. The first is the brand, this is one of the components that you don’t want to skip out on when building a computer. Getting the quality thermal paste will have dramatically better performance then a second hand thermal paste. Next is the method that you apply the thermal paste which will make all the difference. When applying thermal paste you want to use the recommended way for maximum cooling. Traditionally there are three ways to apply thermal paste, a bead in the middle of the processor, a strip down the center of the processor, and spreading it out with a card. Today we are working with the Intel Core i7-3770K processor which the manufacture and our company recommend putting a small bead down the center of the processer. 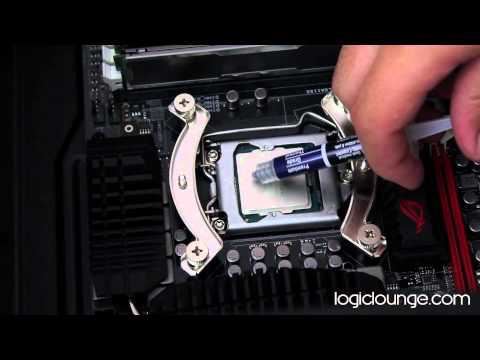 In most new processers this is the recommended way to apply thermal paste because you get better coverage when the CPU cooler is installed and is able to spread it out. For some using the stock cooler that comes with the CPU, you may not have to apply any thermal paste because it already comes with it pre-applied. In some cases it is recommended that you use rubbing alcohol to remove the factory applied thermal compound and replace it with higher quality thermal compound, but you only want to do this if you know you’re going to be working your computer to the limits and need the maximum cooling power. What ever you end up doing make sure you do a quality job the right way the first time or you may be having to drop more money on replacing a burnt out CPU when you didn’t apply it properly. Either way be careful and review with your manufacture says to do when applying thermal paste and use the recommended as per the manufacturer.